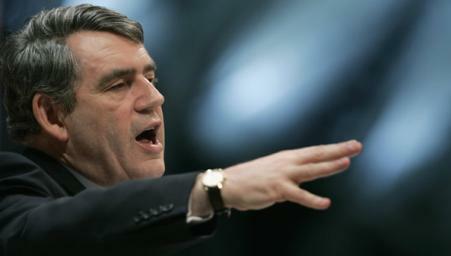 Gold Prices - Gold Prices - Gordon Brown: Breaking The Back Of Inflation? Gordon Brown: Breaking The Back Of Inflation? Not everyone has a comprehensive understanding of how the economy works and that is usually fine as not everyone needs to have a deep understanding. However one would hope that the Prime Minister of a country, especially one with a decade as the Chancellor of the Exchequer, would have some idea how the economy and the world of finance works. It is seriously worrying how little the British Prime Minister Gordon Brown understands about the financial system. Brown is claiming he will “break the back of inflation” and yet we have not seen any evidence to suggest that he understands what inflation actually is. Before we begin looking into what Gordon Brown is saying about inflation, we must confirm what inflation is. Inflation literally means, to inflation, as in to get larger and increase in size. In the financial sense of the word, inflation refers to the money supply and when the money supply increases in size, it inflates and thus we get inflation. Therefore to stop inflation, one must stop printing fiat paper currencies. However this is not what Gordon Brown intends to do. His ideas on battling inflation involve giving pay cuts to nurses, police, fire-fighters and other public service industries. Of course Brown is not calling them pay cuts, he has called them “pay rises below the rate of inflation”, but a pay rise below the rate of inflation is in reality nothing but a pay cut. Brown also said that what goes for the public sector should go for politicians as well saying, “Government ministers must have a rate of pay increase that is below 2 per cent: 1.9 per cent. At the same time, my recommendation is that that is what goes for MP's.” It would be fair that if the politicians were giving nurses and police a pay cut to “break the back of inflation”, they should take a pay cut themselves. However the MP salaries are decided by a different committee and we cannot really see MP's voting themselves a pay cut! We are not hear to voice are political opinions, only to comment on financial matters that affect our investments. We are concerned for the safety of the UK economy as it is, but having someone like Gordon Brown at its head only adds to our concern. Do not forget that Gordon Brown was the “prudent chancellor” who sold Britain's gold reserves at around $250-$270 and with every dollar that gold rises in this bull market, that mistake becomes more and more amplified. If Brown was a fund manager, a trader or held any other position in private industry, that would be fireable offence. However Brown is not alone in his lack of understanding of the financial system. A comment in the Financial Times by the former US Treasury secretary, Lawrence Summers, caught our eye as he was calling for a “fiscal stimulus of up to $75bn (€51bn) to offset the risk of recession.” Well if a recession can be stopped for a mere $75 billion, that's news to us. In the last week of 2007 central bankers created $110 billion and the European Central Bank conducted money market operations that made another $500 billion available, just to keep the system ticking over into the new year! The market is like nature, you cannot stop it moving in one direction. One of the first rules in trading is do not fight the market, because you will always lose. No force is bigger than the market, and so pumping money into the system in an attempt to stop a recession is just like throwing money down the drain. Man has tried to conquer nature, thinking we have the better of it, Titanic is an example of one such attempt, let us hope that these attempts to conquer the natural forces of the market have less drastic consequences. Gold will be the safe haven that investors will flock to when times get tough, subscribe to The Gold Prices Newsletter to stay updated on the gold market and which gold stocks we are investing in.